Oh children of the eighties! I’m actually more of a child of the seventies-eighties-and-nineties myself because all three of those decades were huge learning curves for me. Come to think of it, to be fair I might ought to add this next century or so to the mix. This post isn’t necessarily about being a child of the eighties so much as it is about being around in the eighties because it was such an amazing time with the lightning speed changes in technology. I mean seriously, has any generation seen so many technological advances come into play and then become obsolete in so short a time? I grew up listening to records and 8 tracks, so I remember when the first walkman came out. What an amazing creation that was! No more carrying around a 50 pound boom box – well, unless you were just using it as a street fashion accessory, which was important at times of course. I also remember recording music off of the radio to listen to on my cassette player and whenever I earned enough money to buy a cassette, I’d usually wear it out and end up having to save up to buy the same one again. You know nowadays if you gave a kid a cassette tape with the tape in tangles outside of it they’d immediately say it was broke. But give that same tape to someone who was around in the eighties and they’d get a gleam in their eye as they sat down to scrub in for cassette tape surgery – and you’d most likely be listening to Corey Hart or the like shortly thereafter. Perhaps a little warped, but still entirely listenable. These poor kids are used to perfect digital music quality, they have no idea what it was like waiting on your mom to finish her errand so she’d drive back towards town and the radio station you liked would come in clear enough to recognize the songs again. I remember when my brother got a cell phone. It was one of those bag phones that had a huge strap so you could carry it on your shoulder. It cost a fortune and he’d take it with him when he went out on the wildlife refuge by himself in case anything happened. I think he just said he was going out there as an excuse to have the phone but hey, it was a cool phone so I didn’t blame him. As a teenager VCR’s were regular things inside the home and we moved up from three channels to satellite. We had one of those massive satellite dishes in our back yard, and even then it was considered higher tech than some because, at around ten feet in diameter (guessing here), it was half the size of the “old one” my grandfather had. We had a home computer by the time I was twelve, but it didn’t do very much. It was a Commodore 64 and later we got a Commodore 128, but all of our software was still for a 64 so we had to put it in 64 mode in order to use it! I still remember the first time I began to understand the power of what computers could offer us. We had an encyclopedia disk and I fired it up late one night checking out various subjects for a good read. I found a video clip of John F Kennedy and clicked on it. Immediately, my screen filled up with a video of him giving his inauguration speech. I was stunned and sat there watching it. To be able to see such a thing out of the blue, whenever I wanted! Normally, you could only see such things if they happened to be on television but here I was, in the middle of the night in my own living room and I decided I’d like to watch a former President give his inaugural speech and bam, there it was. Beepers became obsolete when cell phones became affordable and around the time email came into play. I remember having a friend explain email to me and my first thought was “That’s just silly. Why not just call?” Boy have I ever eaten those words! We’ve achieved a lot of technological advances in an extremely short period of time. Our world has become much smaller. I’m not saying it’s all good but there can be good found in most of it, thankfully. It really depends on where you’re looking and what you’re choosing to glean from it. Today, amid a flower garden of information, ideas, and entertainment options, an awful lot of folks are shouting “WEEDS! look at all the awesome weeds I found! YEAH! Weeds! Booyah!”. One of the things from the eighties that I remember though, is not so easy to find anymore and I can’t help but think about it come summer time. Breyer’s came out with this grand dessert called “Vienetta”. 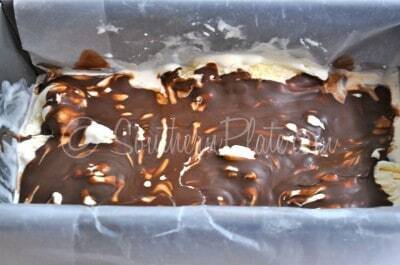 It was a loaf of delicately layered ice cream ruffles and a hard chocolate coating. This was back in the day when Breyer’s Homemade Vanilla tasted like..well like Breyer’s homemade vanilla used to taste. It was phenomenal – but we’ll talk more on that in a minute. 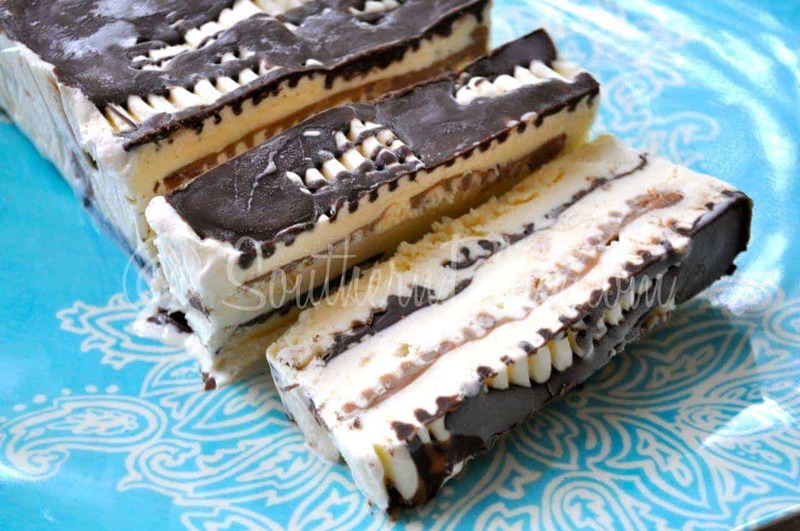 Apparently, Viennetta is still made and sold in some areas but I haven’t seen it around here in a several years and sometimes you really just want it! I think it’s sold all over in Europe so if you’re reading this and living there, head on out and pick some up. ANYWHO here is my version of this classic treat from back in the day that you can make at home. It won’t be quite the same but it’s close enough to satisfy a craving and it’s awfully good in it’s own right! 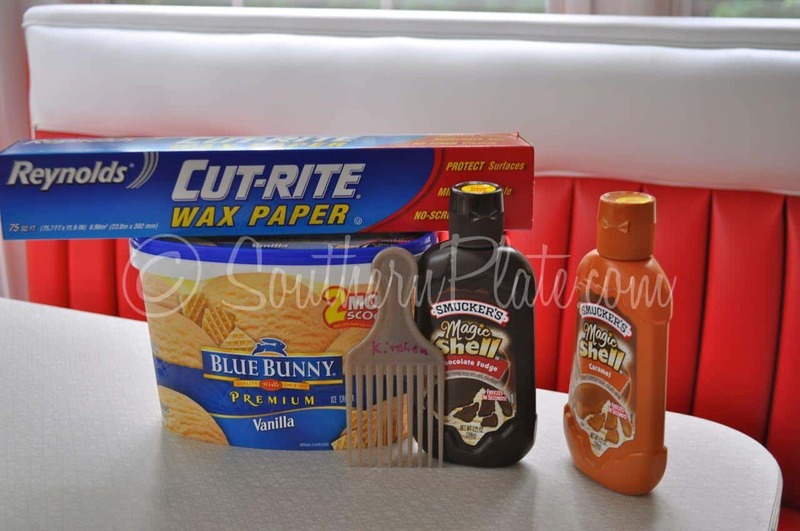 You’ll need: Some good quality vanilla ice cream*, magic Shell (one or two flavors, up to you), waxed paper, and a brand new-reserved for kitchen use only- hair pick. *Back to the Ice Cream. Do y’all remember how Breyer’s tasted when it first got really popular back in the day? They took ice cream to a whole new level. Nowadays though, it just doesn’t taste remotely like it used to – to me at least. Maybe I don’t remember it right though. It could be that my childhood tastebuds glorified it a bit:). Either way, Breyers is still good and all, but I want you to go get the absolute best quality vanilla ice cream you can find. I suggest Blue Bunny (this is the best I have tasted in a while) or something from Bluebell if you have that where you are. Edy’s also makes some very good ice cream and a lot of people swear by Purity, but I haven’t had a chance to taste any of theirs yet so I’m just sticking to the ones I know as reccomendations. Just go for the absolute best in your mind. 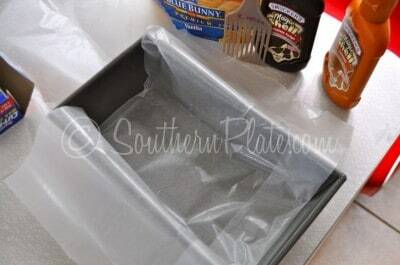 Line a loaf pan with waxed paper. This will help you get your loaf out. 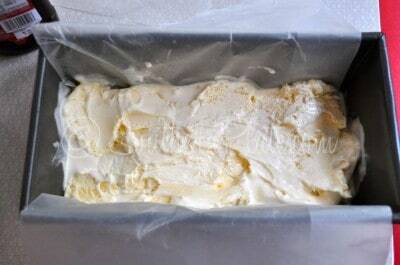 Spread 1/3 of your ice cream into the bottom of the loaf pan. Run the pick along it to form deep grooves. These will fill in with our yummy magic shell. Pour a layer of magic shell over and allow to harden a minute. 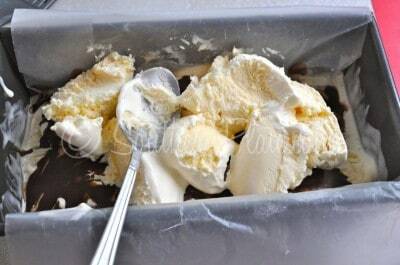 Add another 1/3 of your ice cream and dig grooves into it with your pick again. Pour magic shell over that as well. I’m using butterscotch this time. Now add the rest of our ice cream and dig grooves into it as well. Top this final layer with a drizzle of chocolate magic shell and immediately cover with aluminum foil and place in the freezer until firm. When ready to serve, allow to sit out for about five minutes and then remove from the pan using the waxed paper. Remove the waxed paper and place on a platter to slice and serve. 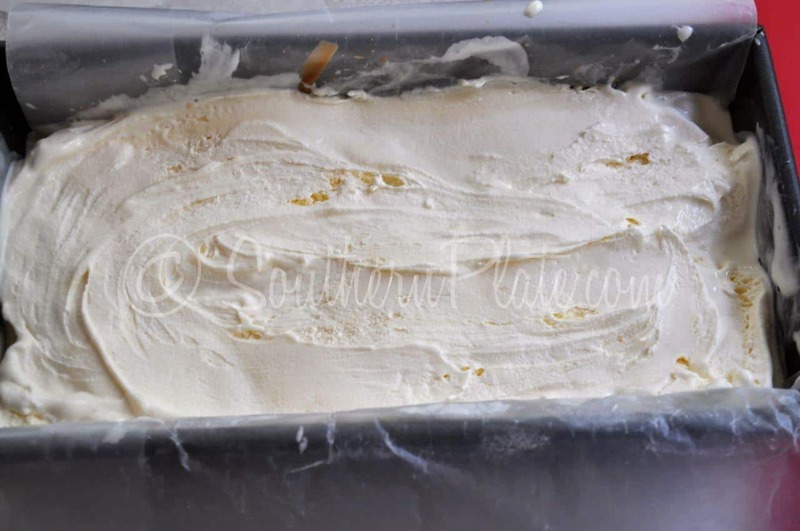 Soften ice cream slightly by allowing to sit out for 5-10 minutes but no longer. Line loaf pan with waxed paper pieces that are long enough to hang over the sides. 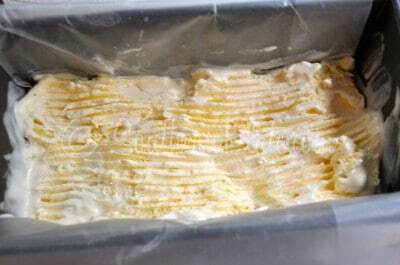 Spread ⅓ of ice cream in bottom of loaf pan. Make grooves in it with the pick. Squirt chocolate magic shell over top, just enough to cover. Allow to sit for one minute to harden. Repeat process using butterscotch magic shell as topping on second layer and then repeat once more, ending with just a drizzling of chocolate magic shell on top. Immediately cover with aluminum foil and place in freezer until frozen solid. To serve, remove loaf pan and allow to sit for five minutes. Grab both sides of waxed paper and pull loaf out of pan. Discard waxed paper and place loaf on platter. Carefully cut and then serve. 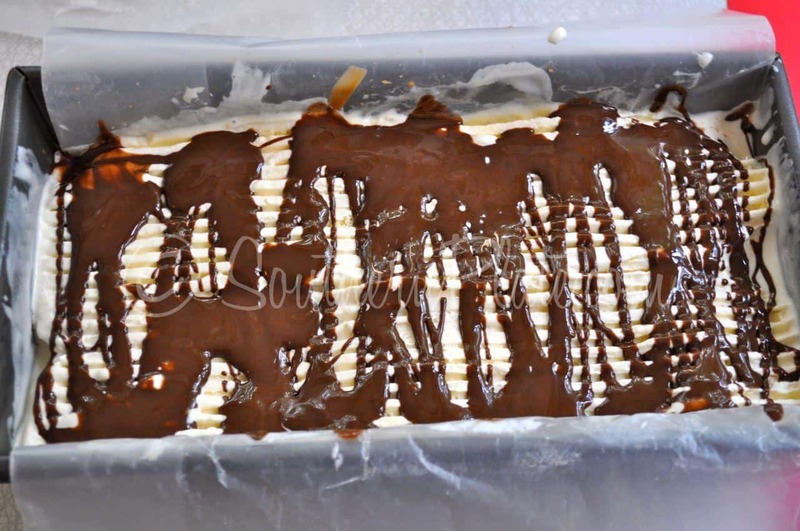 *The original Viennetta did not have butterscotch so go with 2 bottles of chocolate if you want to be more in line with that. Submitted by Diane, thanks Diane! Click here to submit your own positive, funny, or motivational quote – or just browse our ever growing collection! Hello christy! I used to work for an ice cream factory for 8 years and thru those years they made changes like using powder milk instead of real milk and I agree the taste has changed. That company now is about to go under. Eek, I hate that for them but I’d read something like what you said, always better to hear it first hand! Thank you and I hope you know you put smiles on many kids faces with all of the yummy ice cream you helped make 🙂 I bet that was an interesting job! WOAH!!!!!!!!!! Easy peasy!! Just think of all the different ice creams you can use!! YUMMY!!!!!! Thanks for this!! Are you kidding me?! We had a Commodore 64 too! We were the first people we knew to have a computer. Ours had no monitor. It was hooked up to the spare TV! Haha we had this dot matrix printer that had to be wound with the paper and they would forever go ‘off the tracks’ and you had to reload and start again! They still sell Vienetta here but I haven’t had it for years. I only have had it a few times actually as they were pretty expensive treats. Much more expensive than plain ice cream so we never really bought them. As much as I love and live for our modern technologies I think I’ll always feel nostalgic for the reminders of my childhood. There’s a picture that has made the rounds on Facebook of an unwound tape and a pencil with the caption “our children will never know the connection”. Haha! So true! I have something that holds a tomato when you slice it from pampered chef that has the prongs, would probably do the same as the hair pick. I do remember that ice cream, that’s neat. I remember all that stuff and how a #2 pencil works great at reeling back in the ribbon on a cassette tape. We started off with a borrowed TI-99 then moved up to commodore 16, 64 and 128. My grandparents had a intellivision which of course had burgertime as a game. I asked for that and have it but have never plugged it in. I also still have most of my fashion plates. Did you have those? My daughter likes to use mine when I let her. People sell them on ebay. It was a fun coloring activity. I also remember helping my boyfriend at the time run a BBS in college. Boy the internet has really changed over the years that’s for sure! I loved fashionplates!! Thank you for reminding me of those! MMMMMM…..think I’ll go with Blue Bell Homemade Vanilla – closest to homemade I’ve ever had!! Thanks, Christy!! Blue Bell Homemade Vanilla is the best! Just don’t tell my brother in law I said that though, he manages the Blue Bunny ice cream plant! As for the ’80s gosh what a great time to grow up before walkmans we used to strap little transitor radios to our bike handlebars…. I stil have the set of Fisher Price My Friend Dolls and Strawberry Shortcake scented figures… which still smell as strong as they did in the ’80s. Lol I wonder what cancer causing matterial they were made with! Thanks for the yummy recipe Christy!!! Rose -I want to make this!!! Sherri- my mom LOVED these!!! Karen- OMG!!!! i used to love this!!!! i havent thought about it in billions of moons!!!!!! YUMMY! Molly -OH NO. Why must you torture me. Of course I remember this. And yes I will make it. Thank you. And my mother will thank you. Our hips will curse you!!!! Britney – wow, i haven’t thought about this in forever either! Molly – I had totally forgotten about that!!!! Yummy!!! Terri – I use to like it. May still do. If it is related to ice cream I’m game. Tina – you helped me remember the name of it! I have been wondering for a long time what it was called. I couldn’t remember! I loved that ice cream treat. Why don’t they still make it? Su – They still sell Vienettas here! They never ‘crackled’ when cut as they did on the commercials. We only had them a couple times when I was a kid as they were pretty expensive (back then!) so were a definite great. Ashley -I loved that Ice cream!!!! Beth – what do you mean, “the eighties”; I thought it was a couple of years ago. Marie -They reintroduced veinettas here again a couple years ago. I would bet homemade is 100 times better, always is. Emiliana- Wow! What a blast from the past! I remember seeing these in stores. I always wanted to try it, but my parents wouldn’t buy it, lol! I might just have to make it! Tiffany – Wow this just took me back!!! I must make this! Betsy Groh Durnin I totally remember that. It was one of those things I think we only had once or twice because they were expensive. Dannah- Yes!! Thanks for posting! Love it! I thought it was just in my mind about Breyers but then they ‘improved’ their coffee ice cream… one taste and it was like bidding adieu to lifelong love.haha… oh well.. thanks for the fun in re-creating some of those happy tastes from our memories. I definitely remember the ’80s, but I never had Viennetta! The name rings a bell. Looks good! That hair pick is pretty retro. I didn’t know they still sold those things. My mother was as frugal as they come so all we ever had when I was a kid was this store brand Neapolitan ice cream and the strawberry tasted like chemicals. After my husband and I got together we were talking about ice cream and realized that our mothers both got this awful ice cream and no one would ever eat the strawberry. Then they’d refuse to buy any more because, “There’s ice cream still in the freezer!” He did at least have a Commodore 64! He used to type up computer game code by hand that came out of magazines! I still eat Breyer’s because their Carb Smart is very low in net carbs and Publix often puts it BOGOF. I went to get some last week and they only had one vanilla Carb Smart left so I looked for another sugar-free option. They did have no-sugar Neapolitan, but I cringed remembering that awful store brand from the ’70s & ’80s. I bought it anyway, and fortunately, even reduced-fat and without real sugar, it is still better than that stuff from my childhood! I hear that kids today can’t be bothered to do email. It takes too long to type out paragraphs. They just want to do quick texts and Facebook updates. My son always asked for Vienetta for a birthday treat in his middle school yrs . I will have to pass this along to his bride (of 3 weeks) . How did you ever think to use a hair pick ?? I wish my brain worked like that ! If there is a Bruster’s near any of you there ice cream is to die for!! They make it fresh every day. The mocha toffee chip is my favorite. Go to http://www.brusters.com to see if they have one near you. Their ice cream beats Baskin Robins hands down in my opinion!!! You brought back memories of listening to Shaun Cassidy on cassette tape! I bet it would be even more wonderful with graham crackers intermingled with the ice cream. maybe crunched up? or with vanilla wafers? Yum!!! Hi Christy! Thanks-you have great timing-we just finished your oreo ice cream cake! 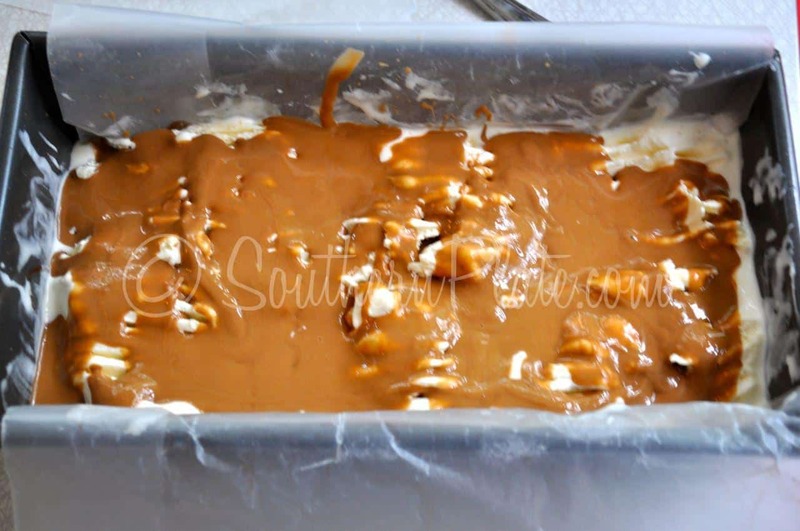 This looks great, I will make it for a family get together. I love your receipes! In the pictures, it looks like there might be a crust on the bottom. If so, what did you use? No crust. Some magic shell seeped down 😉 but I have one I do use a crust on. Cookies or graham work great! The one in the picture looks like it has a crust. Am I just seeing things? I’d think a graham cracker or shortbread cookie crust (or Oreo, heck, almost any cookie LOL) would be good under it all. Wow, what a cute idea. I remember eating that. Definitely will be making this. Thanks for the idea! Oh my goodness, I had totally forgotten about this from back in the day! How exciting! Can’t wait to have friends over and we can all take a trip down memory lane with this. Thanks for the reminder of a simpler time. Awesome Yummy! Will have to try this one immediately! Yum-Yum! I have not made this in years. I put gram crackers in the bottom of mine and minced maraschino cherries in the middle; otherwise it is the same as yours with chocolate shell. I remember the first time I had Breyer’s vanilla bean ice cream. It was my education in learning about where ‘vanilla’ comes from. I loved the ‘black specks’ in it from the vanilla bean. Janet I had that same experience! I was maybe 7 or 8 and at a friend’s house. I was worried that it was pepper in my ice cream! We always had the cheapo gallons of vanilla chocolate ripple at my house so I had never seen real vanilla in my ice cream before. You know, if I hadn’t read this post, wh knows when I would have ever given Viennetta another thought! I loved it, but didn’t get it often because it was so pricey. I would only get it with a coupon. What a great idea with the hair pick! Gonna have to give this recipe a try one of these days. Thanks for the recipe and the stroll down memory lane! can you post the one with the graham or cookie crust too! Thanks Christy! Where do you find magic shell for one dollar? Thanks for the walk down memory lane. The dish looks delish!! Man, I had totally forgotten about this!! Now, I remember it TOO well! Thanks for the great reminder, and “how-to” on recreating it! I sure don’t remember this recipe at all. It sure looks good, and I’m going to give it a try soon. Perfect now that the warmer weather has gotten here!! Thanks Christy!